A cemetery plot is a piece of land purchased for use when burying a deceased individual in a cemetery. The plot is a different charge from the headstone and any other services you may purchase from a particular cemetery. If you want to check for prices on cemetery plots, the most effective way to do so is to call around to cemeteries in your area. Prices vary depending on the location of the cemetery, as well as the location of the plot within the cemetery. 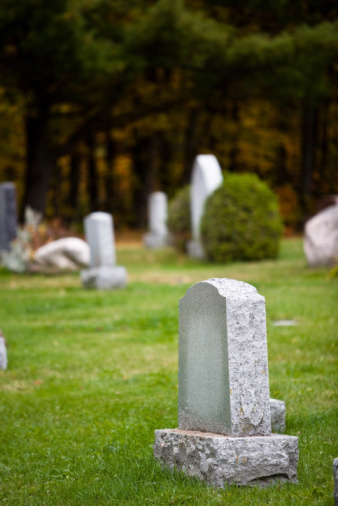 Locate the contact information for cemeteries in your area. If you have already chosen a cemetery (based on either the location of deceased relatives, the location's proximity to your home or some other factor), only look up the information for that particular cemetery. Contact the cemetery and inquire as to the price of cemetery plots. A number of things affect the prices of plots, so ask a number of different questions. Find out what the cost entails (meaning, if general upkeep of the plot by caretakers is included). Find out the price of a plot closer to a road in the cemetery versus the cost of the plot farther away from the road. Find out the frequency at which the price changes, so you know what to expect if you choose to purchase a plot at a later date. Compare and contrast the prices at a few different cemeteries in your area. Call other cemeteries and find out the same information you did in "Step 2." Write this information down and keep it handy. Use the information from a few different cemeteries to help influence your decision as to which location you will enter into business with.